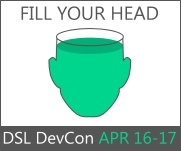 The goal of the DSL Developer's Conference is to cut away all the unessential conference baggage and concentrate on why we're spending time at a conference in the first place -- the talks by industry experts and experienced practitioners. By doing so, we can keep your wasted time to a minimum. In fact, if you don't go away with your head hurting from all the new ideas you've heard, we've haven't done our job! If you're flying, you want to target the Seattle-Tacoma Int'l Airport (SEA). But you can see the videos and download the slides here! There were countless blog posts and tweets. Fabulous conference, folks. Best DevCon ever! This site, and all its contents, are copyright © 2001-2009, Chris Sells and Microsoft, Corp. All rights reserved. Please contact csells@microsoft.com with any comments or suggestions.